"This steamer had an opposed 2-cylinder engine of 15 hp rating. This was hung pivotally from the rear axel and the cylinder end was suspended from [the] boiler." It had tubular steel wheels and its rear-entrance tonneau body carried five passengers. This trade catalogue is trimmed, but provides important information. 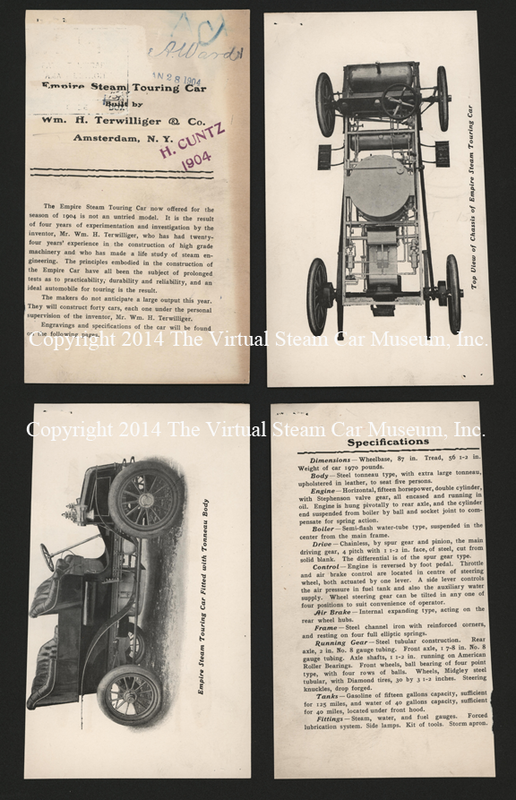 The catalogue is date stamped January 28, 1904 and suggests that in late 1903 Terwilliger was to make 40 steam cars. It is also file stamped "H. Cuntz 1904" and carries the AMA file stamp. The name "George A. Ward" is stamped on this trade catalogue. As is the disassembled trade catalogue above, this complete catalogue is file and date stamped "Jan 28, 1904" and "George A. Ward." John A. Conde Collection. John A. Conde's Empire Steam File Folder. John A. Conde Collection. Georgano, G. N., Encyclopedia of American Automobile, (New York, E. P. Dutton & Co., 1968), p. 72. 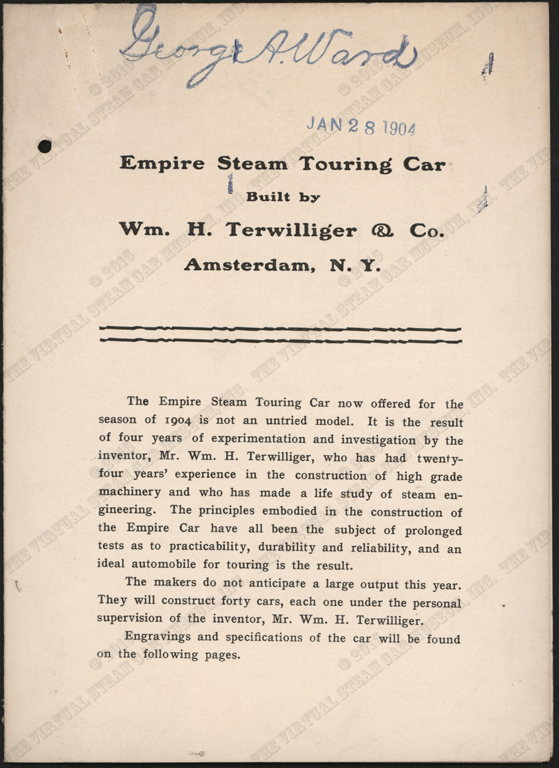 Contact us if you have additional information about the Empire Steam Touring Car by William H. Terwilliger and Company, or if you have questions.